Occupy: One Year On. The lessons learnt is the theme chosen by Giles Fraser for his talks at the Cork, Cloyne and Ross Diocesan Clergy Conference which will take place in Ballylickey, Co Cork starting today (17th October) and lasting until Friday. 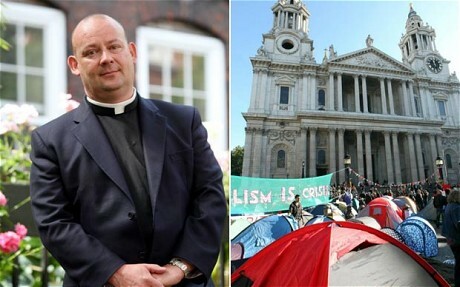 Giles Fraser famously resigned as a Canon of St Paul’s Cathedral, London at this time last year following the decision of the Cathedral Chapter to evict the Occupy protestors by force from the cathedral precincts. Giles Fraser is a priest and journalist, currently serving as Priest-in-Charge of St Mary, Newington near the Elephant and Castle. Before that he was the Canon Chancellor of St Paul’s Cathedral and director of the St Paul’s Institute, responsible for the cathedral’s engagement with the City of London and the relationship between ethics and modern finance. He was the founder of Inclusive Church that lobbies for full inclusion of lesbian and gay people at all levels of the church. He has been nominated as the 2012 Stonewall “Hero of the Year”. His academic training is in philosophy, gaining a PhD in the work of Friedrich Nietzsche, and going on to be a lecturer in Philosophy at Wadham College, Oxford. His general interest is in ethics and aesthetics and currently is a regular lecturer on moral leadership to soldiers at the Defence Academy at Shrivenham. His publications include Redeeming Nietzsche, Christianity and Violence and Christianity with Attitude. He has written widely as a journalist in such diverse publications as The Socialist Worker and the Daily Mail, and currently writes the Loose Canon column for the Guardian. He also is a regular broadcaster on Radio 4’s Thought for the Day and Saturday Review. This entry was posted in Church of Ireland, Clergy Conference, Contemporary Issues, Cork, Diocese, News Release. Bookmark the permalink.